Today started out a little bit rough. I had several...tense interactions with students and wished that there could have been a few of my colleagues present as flies on the wall to give me feedback. With those out of the way, however, I was able to show off some of the terrifying beauty of the universe. The ESO just completed a survey of the Milky Way and uploaded the pictures to their site for anyone to view. They are incredibly detailed, high definition photographs of our galaxy. The image that I downloaded and took to show my students was about the size of a movie (277 MB). It's stunning! I started with the full view image which is, admittedly, unimpressive. In every class, however, as soon as I zoomed in, I heard gasps and their attention was grabbed. we talked about the scale of the universe again and I reminded them that our galaxy alone has over 100 billion stars and that our is just one of millions of galaxies in the universe. 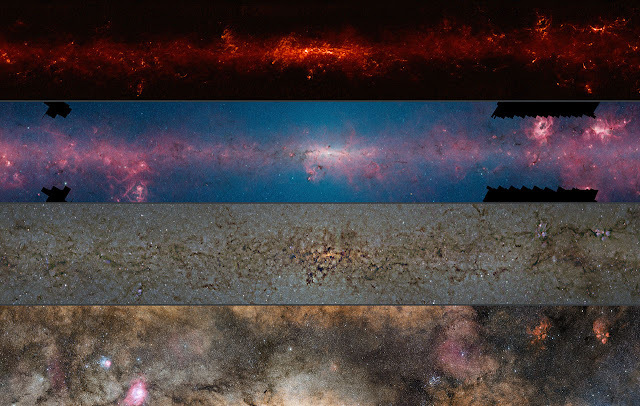 This is the same region of our galaxy as viewed through multiple wavelengths of light. We talked more about constellations and I'm left searching for some interesting activities that don't involve computers. In Physics, we were scheduled to have a test today. Instead, what I offered to my students was the chance to use the first of our double period to go over the chapter review from yesterday. They could take the first part of the test during the second period and finish the test tomorrow. As a class, they agreed. I think the review session went VERY well. We managed to clarify a few of the misconceptions and give some much needed pre-test confidence. It's important for students to feel at ease during assessments. I often write about Astronomy, but I want to take a minute to talk about the Physics kids. I often find them frustrating, but they are such a great group of kids. They are clever, interesting, strange, dynamic, funny and kind. I don't have their attention all the time, but I know that I'll get it when I NEED it. They ask good questions and involve me in their lives, including activities and interests. They are always a great class with which to finish my day.